In the 19th century the Fitzgerald sisters, Ginger and Brigitte, take refuge at Fort Bailey, home of the Northern Legion Trading Company. But the ground is cursed, and no one leaves for fear of the monstrous beasts lurking in the area. Now, Ginger and Brigitte's vow to stay "together, forever" gets tested as one of the sisters slowly slips into a darkening fate. Once again I prefer the first one. But this one is very good... I enjoyed it about as much as the second one. This one is of course a prequel. It shows how the Fritzgerald sisters has been cursed through-out time... in all their previous lives. I thought it was a quite original idea. At least I personally haven't seen it often at all. I do wish they would have changed the girls personalities at least some in this one since it wasn't meant to be within the same lifetime. You would think they would change some from one life time to another. But in this case they not only have the same names... but it is like they have the same personalities as well. At least that is how it seemed to me. From the director of Gremlins and Piranha comes the ultimate masterpiece of primal terror. Filled with edge-of-your-seat suspense, "genuine thrills [and] amazing special effects" (Us), this riveting werewolf tale sinks its teeth into your deepest fears and never lets go! Severely traumatized by a near-fatal encounter with a serial killer, TV newscaster Karen White (Dee Wallace) takes time off at a secluded retreat called "the Colony." But when, after nights of being tormented by bestial, bloodcurdling cries, Karen ventures into the woods seeking answers, she makes a terrifying discovery. Now she must fight not only for her life...but for her soul! This is another one that I enjoy quite a bit. Released the same year as An American Werewolf in London... but doesn't rank quite as high for me. Don't get me wrong It is still an entertaining movie that I enjoyed a lot. But time wasn't as good to this one as it was to An American Werewolf in London. While watching it I felt like I was watching a nearly 30 year old movie. That wasn't the case on the other one. I did enjoy Dee Wallace in this movie. She drew me right in. And I especially enjoyed how they ended the movie. This one also had good werewolf transformation effects. 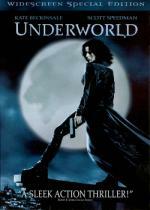 In the Underworld, Vampires are a secret clan of modern aristocratic sophisticates whose mortal enemies are the Lycans (Werewolves), a shrewd gang of street thugs who prowl the city's underbelly. No one knows the origin of their bitter blood feud, but the balance of power between them turns even bloodier when a beautiful young Vampire warrior and a newly-turned Lycan with a mysterious past fall in love. Kate Beckinsale and Scott Speedman star in this modern-day, action-packed tale of ruthless intrigue and forbidden passion – all set against the dazzling backdrop of a timeless, Gothic metropolis. Werewolves, Vampires, Action, Romance... this movie has it all. I know of many people that don't care for this combination of action and horror... but I have always liked it. This is actually the first time I watched this movie in quite a while. I really enjoyed this movie. It has lots of great action and beautiful imagery. I especially liked the look of (as they put it) the Gothic metropolis. While I liked the look of the werewolves in this movie... I felt a little disappointed in the transformation. I mean the CGI effects for it is alright... but after watching movies with it done "old school" I much preferred the look of the transformations from 20 to 30 years ago. But over-all I really enjoyed this movie. I am glad I decided to watch it again. Another we agree on! This movie is trash, but I think most people missed the point, and the point of it's sequel (which was worse) because it's classy trash! It's a high concept Gothic horror comic, where imagery and mood comes long before common sense, hence why you have supernatural beasts using guns instead of ripping each others throats out. It looks cool and it's great fun. Apparently the third film fails entirely though and smacks of the producers just cashing in. Which is really scraping the barrel in this case when you think about it! Will you be fitting the peerless Dog Soldiers in? Do to today being mothers day... and us having plans for my mother... I am ending this one early. I actually had a lot of fun with this marathon. I revisited a lot of really good werewolf movies this weekend. I have a nice modest collection of Werewolf movies. Here is my list. If there is any here you are curious about please feel free to ask and I will do my best to fit it into the marathon. So between what I watched this weekend and the links above... that is 8 of the 9 you asked about. Not bad anyway... huh? Sorry not today... have some plans with my mother but as I posted above I have reviewed it before. And I loved it! This one also had good werewolf transformation effects. Weren't they done by Rob "almost-as-famous-as-Rick-Baker" Bottin who also did The Thing...? No worries... And yes, we should be seeing it as 8/9. Thanks. I am not sure... crew is really not my thing.... and this one hasn't been updated for effects yest in DVDP. Easy to find here in Canada, since it's a Canadian movie and not an independant movie at all Pete . Most of the money had came from the federal and provincial governements like it's always the case here. This is the Canadian dvd, Much better than any others release in other country. and if you want to get the best one after the original at the same occasion. Thanks for the correction Jimmy! And looks like you all have a collector's edition! I may have to upgrade to that one... ours only has the trailer as an extra (If I remember right). yeah... slightly! Looks like I will have to upgrade before too long! I don't normally order stuff from Canada as usually the USA releases are better or equal. I could just make an exception here and order just that single item from there. I'll give it some thinking over the next few days.